Macherey Nagel Visocolor ECO DEHA kit. Method is the measurement of the reduction properties of DEHA for iron(III) ions and determination of the iron(II) ions formed. In boiler houses the carcinogenic hydrazine is more and more replaced by diethylhydroxylamine (DEHA) to remove oxygen. 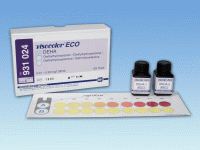 Colorimetric test kit, gradations 0 ? 0.01 ? 0.03 ? 0.05 ? 0.10 ? 0.15 ? 0.20 ? 0.25 ? 0.30 mg/l DEHA.